John McArthur discusses the potential for split-brain scenarios and how to mitigate the risks. 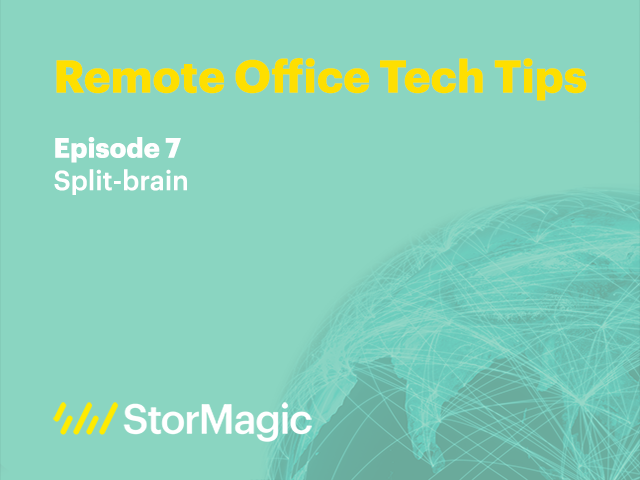 Remote Office Tech Tips is a series of short videos from StorMagic offering advice on the technological challenges faced when managing remote sites. Deploying and supporting traditional infrastructure for remote offices, retail stores, and hospitality sites can be challenging. Virtualization and high availability can prove complex and costly, often leaving the IT team no choice but to cut corners and send valuable IT resources into the field with short notice. Join us to hear how StorMagic’s software-defined storage platform, SvSAN, leverages Cisco Unified Computing System (Cisco UCS) infrastructure to offer you the best of both worlds - hyperconverged, low-cost, and highly available IT infrastructure for remote sites. Hear from Brenntag and Enterprise Strategy Group about how StorMagic SvSAN and Cisco UCS can deliver a highly available converged server and storage footprint at remote sites without compromising performance whilst cutting OPEX and CAPEX costs in half. Are you aware of the benefits of hyperconvergence? Or do you think it's not for your business? In this webinar, Gartner and StorMagic demonstrate why it should be at the forefront of your IT modernization agenda. Join industry experts Arun Chandrasekaran, Research Vice President at Gartner & Hans O'Sullivan, CEO at StorMagic as they explain why and what you should be doing to take advantage of hyperconvergence. John McArthur discusses consideration for wide area networks in application architecture. John McArthur discusses reduce response time requirements to ensure application reliability. John McArthur discusses serviceability and support requirements for remote office branch office. Remote site environments have specific IT challenges around footprint, on-site expertise and the cost of deployment and maintenance. Join Mark Christie, Senior Systems Engineer at StorMagic for this webinar as he explains how SvSAN is ideal for these deployments. Virtualizing your storage? Replacing your physical SAN with virtual SAN could save CAPEX and OPEX as well as cooling, power and maintenance costs. Join Mark Christie, Senior Systems Engineer at StorMagic for this webinar as he runs you through why you should consider software-defined storage to replace your costly physical SANs. John McArthur discusses the suitability of cloud storage for remote office branch office applications and certain types of data. John McArthur talks on how best to minimize your hardware footprint with a lean virtualized storage solution. John McArthur considers factors that affect the speed of deploying infrastructure at new remote sites. John McArthur discusses how downtime can impact your organization's bottom line and how to prevent it. John McArthur discusses options for deploying a quorum server including the use of a remote quorum. John McArthur discusses the options available for organizations that require shared storage. John McArthur discusses how to deliver maximum uptime for your applications with high availability. John McArthur discusses the requirements for organizations that need high availability. John McArthur offers his advice to organizations consolidating their branch office infrastructure. Dave and Larry are responsible for IT in their organizations. Larry's flying high after ditching physical SAN for virtual SAN across his organization. Meanwhile Dave's career is stalling. With a new deployment to come in Dave's organization will he listen to Larry and become an IT hero with StorMagic SvSAN 6? Don't be a Dave! Be a Larry and choose StorMagic SvSAN, the most cost-effective, centrally managed virtual SAN for SME and distributed enterprise, and reduce your server and software spend by as much as 40%. SvSAN makes the proven benefits of virtualization technology available to more cost sensitive SME and remote office locations. Although data stays local virtual environments can simply be managed from a central location, which removes the need for dedicated specialist IT staff at each site. SvSAN delivers performance and reliability where it’s needed most; the remote and branch offices where customers connect with the brand. StorMagic is a software-defined storage company enabling hyper-converged infrastructure for enterprises and SMEs to modernize IT. StorMagic offers SvSAN, the most cost-effective, centrally managed virtual SAN, removing the need for a physical SAN and reducing server and software spend by as much as 40%. SvSAN delivers performance and reliability where it’s needed most; the remote and branch offices where customers connect with the brand.